A man much smarter than we are once wrote that “all that is gold does not glitter.” Now, sure, Gandalf may have been referring to Aragorn, but consider for a moment that he might have been talking about the Specialized Evade Tri. Let’s get it out in front; the helmet looks a bit… weird. There are vents where we don’t expect them, dramatic swoops, and a giant rear exhaust that looks more LeMans prototype than cycling helmet; all adding up to a lid that takes a dramatic departure in design, even from its own “aero road” category. It would be fair to say that the design is unorthodox, but we’re pretty sure that the Evade lives up to the hype. It shouldn’t really come as a surprise, given McLaren’s continued involvement with Specialized, that the Evade shares design features with the TT3 (and the newly released TT4) helmet. 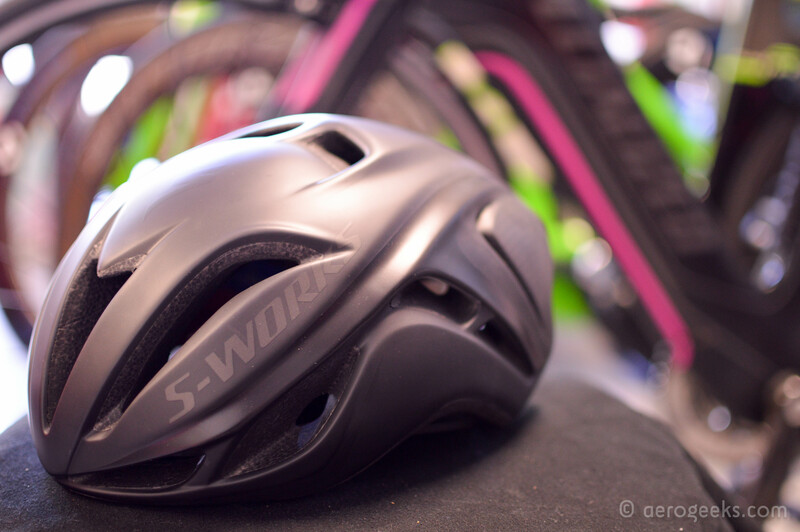 Specialized themselves describe the Evade as coming directly out of the project and applying a number of lessons learned to their fast road lid. The gill slits on the side of the Evade, just like the McLaren, are dual-purposed to clean up dirty air around the side of the rider’s head and cool him off before being exhausted out the truncated rear tail. The lay-flat system for the straps, near as we can tell, is identical. We may not be able to afford a McLaren helmet, but the Evade is close enough for us mere mortals that we may not have to shove the flaps of a full-on aero helmet over our ears as we’re racing to get out of T1. 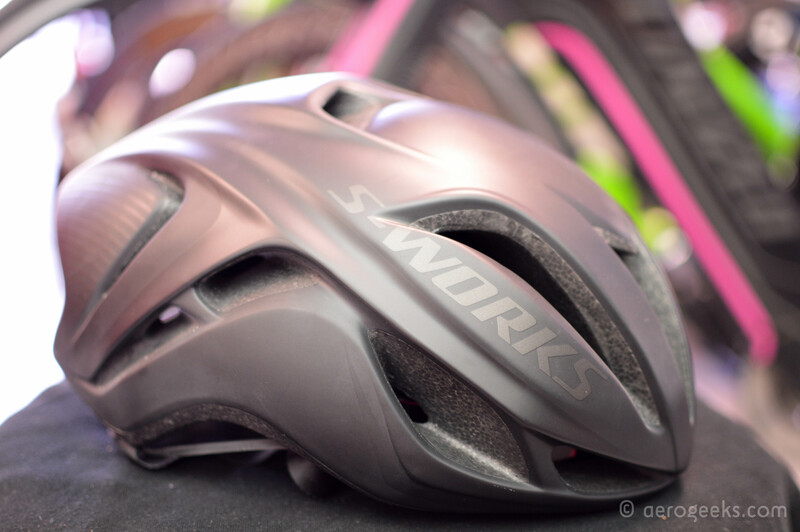 We already examined the claims Specialized is making about the helmet in our First Look from when they officially launched it at the 2013 Tour de France, so we’ll not be going over them again in any detail. 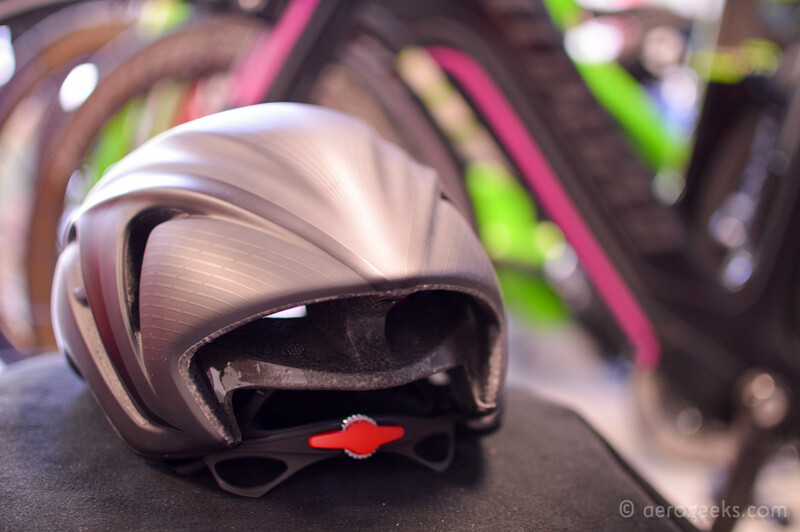 The big detail you need to remember is that Specialized says the Evade saves 46 seconds over a 40km TT versus their own Prevail, a pretty good road helmet in its own right. In riding with the Evade, we can say that the helmet certainly seems slippery to the wind, and has a noticeably reduced amount of wind noise versus our standard road helmets. Without a wind tunnel and a whole lot of time, we can’t corroborate Specialized’s data. Although we also don’t see a reason to doubt it at this point in time – the helmet really does feel fast. What has been more surprising to us has been the sheer amount of ventilation that flows through the Evade. With seven large vents up front, the helmet does an absolutely incredible job of keeping your head cool, even on hot days. When looking ahead, the three largest, most central vents direct a massive amount of air into the helmet, more than a match to any standard road lid we’ve ridden. It’s what happens when we duck our heads slightly and drop into an aero position that astonished us, however. Those two jet-intake looking vents on the top of the helmet? We think they have every reason to look like jet intakes. The minute your head points downward even the slightest bit and they become exposed to the wind, it feels as though some kind of turbo fan inside the helmet kicks in. Suddenly it’s as if you have your own personal air conditioner going full blast over the top of your head and out the back. If we still feel this way in a few months, we have the following message for Chris Yu, head aerodynamicist for Specialized: you will have done the impossible and given us a helmet that features better cooling in the aero position than it does when riding upright. That’s no small feat. Some of the features that help the Evade cheat the wind aren’t quite as obvious as the helmet’s dramatic shape. The helmet straps, for example, lay absolutely flat against the sides of your face due to a new join system called a “Tri-Fix Web Splitter.” That splitter is very wide, and while it isn’t adjustable in terms of where it falls on your head, it leaves plenty of room for your ears to clear without any rubbing issues. The result is that you don’t have to fiddle with anything other than where the magnetic clasp falls under your chin. The entire system, thanks to that Tri-Fix, hugs the contours all the way around while avoiding restricting breathing. For anyone who has ever dealt with road helmets’ retention strap adjusters, this is possibly the best feature of the Evade, period. It’s also important to note that the strap’s magnetic clasp system is only available on the Tri model, and is also fairly easy to work one-handed with a little bit of practice. 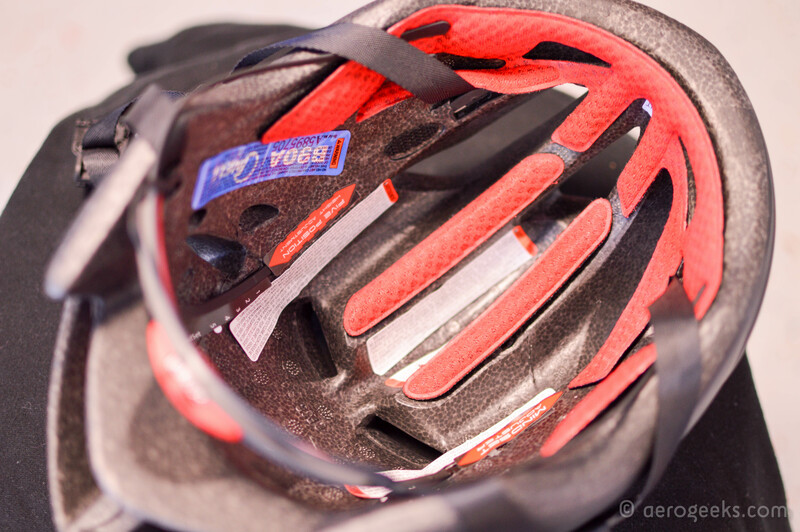 Taking the long strap’s closure and simply guiding it towards its mate will result in a satisfyingclick as well as a secured helmet, all without having to take your hand off the bike as you’re dashing out of transition. Removing the helmet is similarly one-handed. A push at the protruding tab on the closure will spring the latch open and make it easy to take off in T2. Going forward, we would not be terribly surprised to see this feature make appearances in traditional time trial helmets, as it really speeds up your transition to have a hand free to handle the bike on entry and exit while those precious seconds tick by. We still have some significant time to spend with the Evade, and are really looking forward to seeing what it has in store for us. 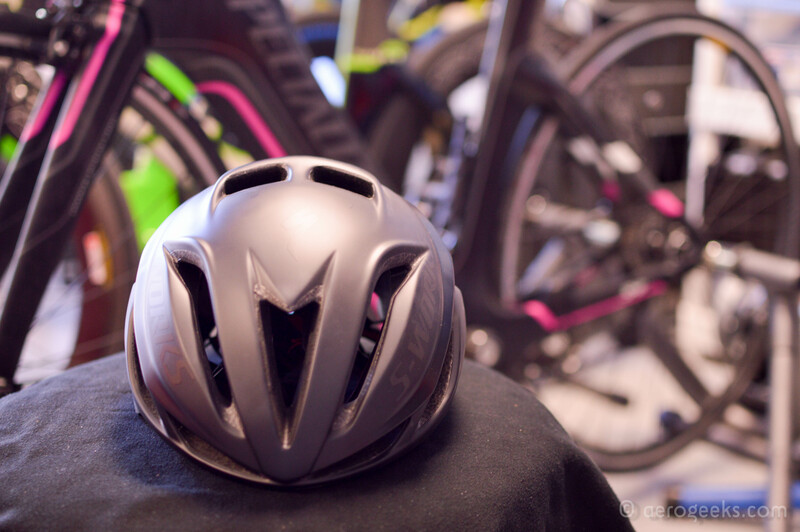 So far, it has shown itself to be an incredibly capable, fast, and cool helmet to ride, as well as having features that are great for triathletes specifically. In the coming months, we’ll be seeing how it holds up, and if it really is, as Specialized claims, the best of both worlds. For the moment, though, we’d be hard-pressed to argue that sentiment. “all that is gold does not glitter.” is from Gandalf you say..? *AUCH! * My confidence in you just took a huge drop! @Maarten, this saying is from Tolkien. You’re likely getting it confused with the standard “All that glitters is not gold”. Auch to you! Helmet is very technically interesting but incredibly ugly.